This is the BEST time of the year! Unfortunately, we make it more than what it should be, and it becomes the busiest/craziest time of year! Our schedules become so full and we hardly have time to breath let alone exercise. So, below I have made up a fun little workout called the 12 Days of Fitness. It’s quick and meant to be done everyday for the next 12 days. Just like the song, start with day 1 with exercise 1 and finish on day 12 with a circuit of 12 exercises. You can hold on elbows and toes for 1 minute or to modify alternate between toes and knees (toes for 10 seconds and knees for 3 seconds). Do not let your back sag and keep your belly button pulled into your spine (TVA contraction). You never have to jump. 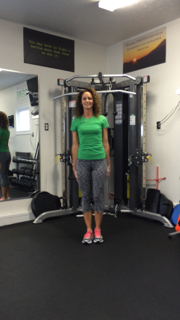 To modify, keep your arms moving and step one heel out and back in towards body, alternate between legs. Basic crunch – you want to keep your elbows out and rest hands on back of head. Do not use your hands to help pull yourself up. Instead, contract your abs, keep back in neutral position along with pelvis, and lift shoulder blades off the ground and up towards the ceiling. Keeping your neck straight and chin up. 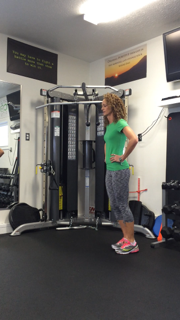 Heel touch – Arms at your sides, raise your shoulders slightly off the ground. 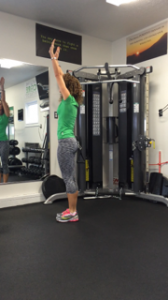 Using your abs rotate our right hand down to your right heel and then back. Repeat on left side. Reverse crunch – this is a very small movement so you want to contract your abs to lift the hips off the floor rather than swinging your legs and creating momentum. This is very hard to do so if you are starting out, the modified move is bringing the knees into the chest and using your abs to lift hips off the floor and using momentum is OK here. With your feet together, jump up in the air reaching hands up. Land on slightly bent legs, put hands on ground just in front of your feet. Keep your feet together and jump them back so you land in a push-up. 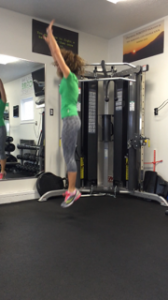 Jump your feet back in, under your body, and leap up into the air. 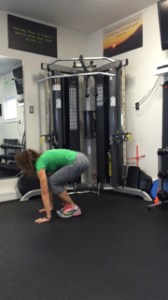 Modify this by not jumping and stepping one foot back at a time into a push up position. Lie on your side with your right elbow and forearm on the ground. Lift your hip off the ground keeping your body in a straight line, tightening your abs and glute muscles. Hold 1 count and lower right hip back down to the ground for 1 count. 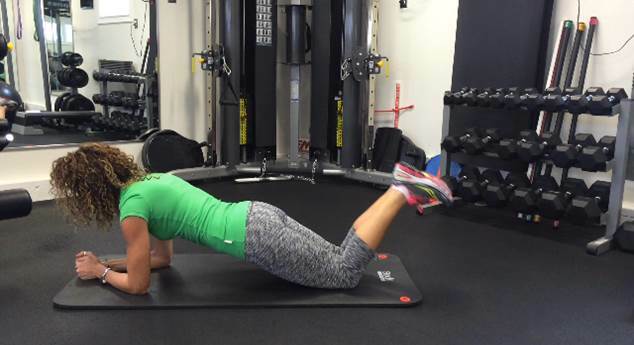 Modify this by bending knees, lift hip off ground pressing into elbow and knees. Hands at your sides, palms facing down. Bend elbows to lower your body down off the bench, keep legs straight for more of a challenge. Extend arms to push your body back up until arms are straight. To modify, bend your legs and use them for more support. Begin in a push up position on hands and toes. Bring right knee in towards the chest with right foot off the ground. Bring right foot back and down to starting position and bring left knee up towards chest. To make this more of a cardio challenge you can pick up the tempo by running the knees in and back out. 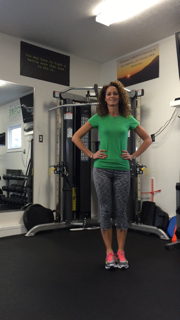 Stand with feet hip width apart. Squat with arms overhead (forming a “Y”). Keep your knees behind your toes and as you come up, press through your heels back to your starting position. Place hands slightly wider than your shoulders. Raise up onto your toes so you are balanced on your hands and toes. Keep your body in a straight line from head to toe without sagging in the middle or arching your back. Bend your elbows to 90 degrees and press back yourself back up to starting position. 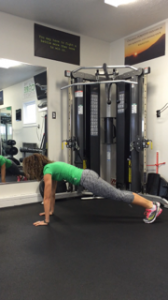 You can modify by being on your knees during push up. Stand with your feet about 6 inches apart from each other and your toes pointed forward. Step forward with one leg and lower your body to 90 degrees with both knees. Keep your weight in your heels and don’t allow your knee to cross the plane of your toes. Push up and back to the starting position. Lie face down on the floor with your arms stretched out above your head and your legs extended. Lift your arms and legs off the floor as if you were superman flying. 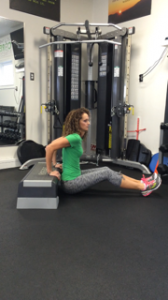 Hold 3 seconds and then slowly lower your arms and legs back to the starting position and repeat. Stand upright with arms at your sides. Step your right foot out to the side keeping toes of both feet pointing forward. Bend your right leg to a 90 degree angle, squatting down. Keep your left leg extended straight and your left foot flat on the ground. Push your right foot off ground and back to center. For more helpful fitness tips watch my workout videos!